The Vikings called North America "Vinland," the land of wine. Giovanni de Verrazzano, the Italian explorer who first described the grapes of the New World, was sure that "they would yield excellent wines." And when the English settlers found grapes growing so thickly that they covered the ground down to the very seashore, they concluded that "in all the world the like abundance is not to be found." Thus, from the very beginning the promise of America was, in part, the alluring promise of wine. How that promise was repeatedly baffled, how its realization was gradually begun, and how at last it has been triumphantly fulfilled is the story told in this book. It is a story that touches on nearly every section of the United States and includes the whole range of American society from the founders to the latest immigrants. Germans in Pennsylvania, Swiss in Georgia, Minorcans in Florida, Italians in Arkansas, French in Kansas, Chinese in California—all contributed to the domestication of Bacchus in the New World. So too did innumerable individuals, institutions, and organizations. Prominent politicians, obscure farmers, eager amateurs, sober scientists: these and all the other kinds and conditions of American men and women figure in the story. 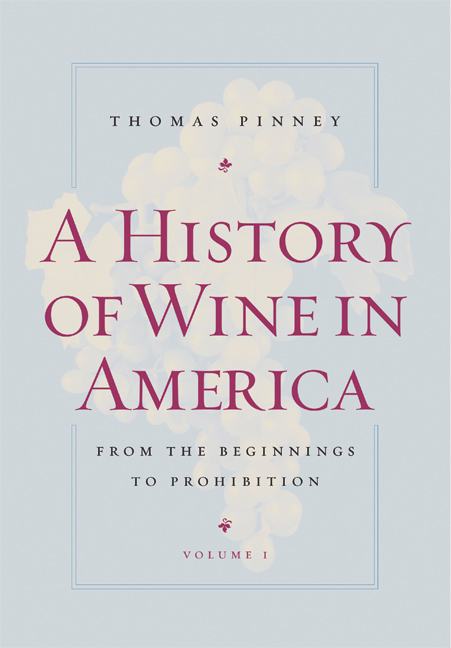 The history of wine in America is, in many ways, the history of American origins and of American enterprise in microcosm. While much of that history has been lost to sight, especially after Prohibition, the recovery of the record has been the goal of many investigators over the years, and the results are here brought together for the first time. In print in its entirety for the first time, A History of Wine in America is the most comprehensive account of winemaking in the United States, from the Norse discovery of native grapes in 1001 A.D., through Prohibition, and up to the present expansion of winemaking in every state. Thomas Pinney is Professor of English, Emeritus, at Pomona College.